Eric Brody ’10 and Ben Hart ’11 founded Qinetic, a website offering free virtual fitness classes. In an age of too much information and not enough time, Qinetic strikes a healthy balance. Created by Eric Brody ’10 and Ben Hart ’11, Qinetic offers free live-stream workouts, fitness tips and healthy lifestyle coaching. All you need are 20 minutes and an Internet connection. First-time entrepreneurs Brody and Hart met at Manhattan College and were roommates before business partners. Brody graduated in 2010 with a degree in finance and economics, and took a job at the Federal Reserve, while Hart, a boxer and personal trainer at Equinox, finished up his studies in psychology the following year. Seeing a need in the fitness community that wasn’t being met, the pair moved to the Lower East Side to delve into their startup full-time. “We weren’t in a garage,” — this is New York City, after all — “and we weren’t writing algorithms on the windows, but I think we did go to Staples and get about six white boards, and set them up in the apartment,” Brody laughs. Now in its fourth year of business, Qinetic has connected with 15 coaches — the trainers who run the live-stream sessions — and offers daily content ranging from yoga to nutrition to fitness fashion. Using their complementary skill sets to run the day-to-day operations, Brody manages the finances as CFO and COO, while Hart takes on more of a front office role as CEO, working on marketing strategy, recruiting coaches and maintaining relationships. Both Brody and Hart credit their time in Riverdale as instrumental to their success at Qinetic. For one, they’ve learned that Jaspers tend to stick together. 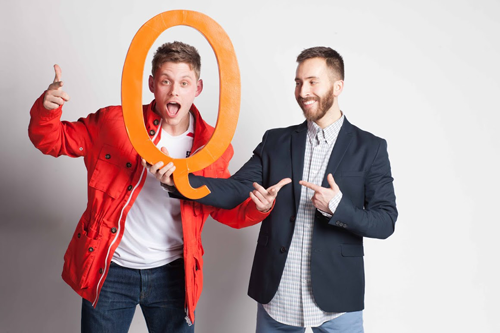 “I met a lot of great friends for life at Manhattan — Ben and other individuals who supported the company and the brand through all the ups and downs of the startup,” Brody says, also noting Stephanie Iannello ’12, a secondary education and English major at Manhattan, who’s managed public relations for Qinetic since the beginning. Hart says being in New York City had always given him the energy and drive to work hard, but that it took him until after graduation to realize that some of the best takeaways appeared in the pages of his psychology textbooks. Since graduating, Brody and Hart have both returned to campus to share their story. So what does the public want? They’ve hosted live Q&As with instructors, are constantly active on social media, and even added an on-demand feature so that users can view videos whenever it suits their schedule. But the next step is to make Qinetic’s content a two-way conversation, Brody says. Users will be encouraged to create profiles so that they can interact with each other, as well as the instructor, regardless of where they are in the world. And while other interactive services will be available at different membership levels, Hart assures that Qinetic’s focus on “free” will stay.